effeciently manages the Q without any manual interruption. Big Display for the customer view and individual display on each counter (optional) can be provided. 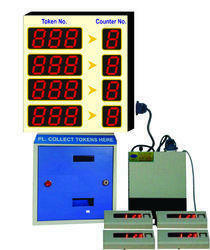 Token issuer or printer is interfaced with this Q mangement system so as to totally remove the manual interruption. very effective in managing queues on first come first serve basis thereby reducing the waiting time. Cabinet Size 6" x 20"
With its sleek design the product is very attractive and reliable. Availble in 2" and 4" character height,single sided/double sided. parallel display can also be adopted if required. This is a custom built thermal printer with the auto cutter facility. Prints the name in the top with date and time below and token no in the middle. 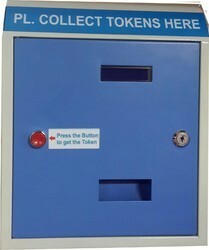 This automatic toke dispenser can be customized to generate single or multiple queues with different serial numbers. 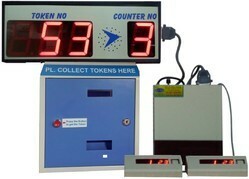 LED Q managent system for billing /registration counters is one of the major and essential equipment in the for Hospitals. Big customer display is provided to view the Tokens at the common waiting hall with the voice announcement to alert the customers during their turn. Customers collect their token at the front desk and wait for their turn ,can relax. Staffs are provided with a calling button on their table.to press the call whenever their counter is free. Queue management system can give you valuable information about your visitors. You can use that knowledge to better understand how to improve your current service design. what service are they interested in. This advanced Q management system offers you the best service in managing queues. 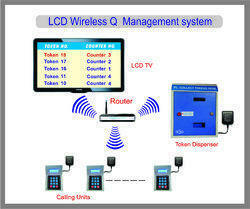 This system works on wifi, that is no cabling required in the installation. easy maintenance and effecient working makes the system owner's and user's friendly. 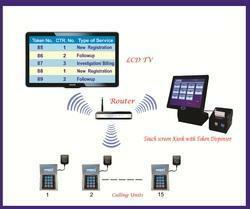 Very usefull in managing queues at any places namely in Banks , Hospitals, Private sectors, Post offices, Airports, Reservation counters, Pharmacy, service centres, registration counters and many more. Looking for Queue Management System ?